Grafix Laminating Film is a transparent, tear-resistant, permanent adhesive film that's quick and easy to use: just peel and apply! 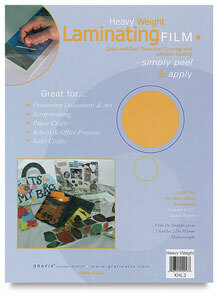 Get professional looking, clear laminations in an instant with no mess and without expensive equipment. Use Grafix Laminating Film to preserve photos, artwork, and maps, and in the creation of tag art, bookmarks, signs, magnets, and placemats. Lightweight Film — This film performs the same as the Heavyweight Film, but it is thinner and more flexible.